Things to do in Santorini, from where should we start? There are so many things you can do on our island. You will probably need more that 2 weeks to do and see all the things that Santorini offer. Here is our list of recommendations regarding some of the things to do in Santorini. Santorini sunset. Probably one of the most famous in the word… But why? There are so many beautiful places in the word where you can enjoy stunning views and especially when the sun goes down. What makes Santorini sunset view unique it’s the island terrain combined with the beautiful and unique world wide building architecture. Watching the sunset from a 300 meters high vertical cliffs, above the sea, at a croissant shaped island as the sun does down behind a volcano it’s not everyday experience, beside of course if you are a local inhabitant of Santorini. The colors of sky are amazing and changing every minute as the elevation of the sun above the horizon is changing. There’s no mountain or anything else that can block your view of this fantastic event. Maybe only the few thousand people gathering on the east edge of every village of the west coast of Santorini to admire the same thing. Don’t forget that the sunset is not the only beautiful view at that moment in Santorini. Try to have a look on the island itself. The colors of the white houses of the villages are almost changing, as well as the colors of the vertical cliffs of west Santorini. There are many places where you can enjoy Santorini sunset. Kastro (castle) in Oia, all the west side of Fira, Firostefani and Imerovigli are a great place. If you are willing to take a drive to see it from a different and more impressive angle, you should go to the lighthouse in Akrotiri. From there you will also have the view of all Santorini. Santorini sunset is definitely in the category things to do in Santorini. This should be on your No 1 choice on things to do in Santorini. Santorini volcano, almost everyone knows that it exists. But how many people know that its eruption, about 2000 BC, was the second biggest in the human history? They call it the “Minoan eruption” because there is evidence that the eruption of Santorini volcano was responsive for the declining of Minoan civilization, unleashing massive tsunami towards the island of Crete. Santorini volcano is the main attraction of the island, so you shouldn’t miss a visit. Every day small as well as bigger boats transfer thousands of people to this spectacular place. Their departure points are Ammoudi, which is the port of Oia located right below the village, Athinios which is the main port of Santorini and Gialos which is the old main port of the island, located right below Fira. You should know that a walk to the volcano is not that easy. Don’t forget that in order to reach the crater you will have to walk uphill and downhill on a trail, in hot summer sun. Therefore you should have with you water and quite a lot of it, wear sport footwear, a hat, prefer a white color clothes and a sunscreen. We recommend that you book a tour that takes you to Nea (nea=new) Kameni which is the volcano with the hot ground and the crater (as well as the youngest developed island in Mediterranean), to Palaia (palaia=old) Kameni which is the small rocky island behind the volcano where the hot springs are. Hot springs is the area in a natural bay where the hot, volcanic rocks warm up the sea water. The color of the water is yellowish and greenish, clearly revealing the differentiation of this particular bay. There you can have a thermal sulphurous bath. Quite impressive are also the rocks that are surrounding the bay. Be aware that the sulfur smell from the hot water may stick with you for awhile. The next stop should be Thirasia. This is the island north of the volcano. Thirasia looks very much like Santorini, but it’s much less unspoiled due to less intense infrastructure development. In south Thirasia you can witness something quite impressive. Located in Tripiti cape there is and old vertical magma vein, revealing itself at its profile. Volcano visit is the dominating thing to do in Santorini. Santorini wine tour is definitely in the category things to do in Santorini. Santorini wine is one of the most recognizable brands in this industry due to its quality. The volcanic land, the meteorological conditions and the geomorphology that exist in Santorini, has created an ecosystem that can deliver this unique product. The most well known Santorini wine varieties are Assyrtiko with its distinguish taste, Nykteri and Vinsanto which is the sweet white wine. Nykteri use to be considered the luxurious wine due to its making process. To produce Nykteri, locals use to collect and transfer the grapes during the night to the (well known) cave houses where they start the process of winefication immediately. This procedure was adopted in order to protect the grapes from the heat of the sun and transfer them from the field to cave houses before their temperature rise, (nykta= night). Local inhabitants of the island are cultivating wine grapes for thousands of years. That experience of winemaking gained Santorini wines international recognition. Many people believe that Santorini vineyards should bee a protected natural monument. In Santorini you will find many agencies that are specified in wine tours. You will have a variety of your choices, depending on what you prefer. There is usually a combination of wine tasting and cooking or learning about Santorini wine history making. During your wine tour, which lasts between 3 and 6 hours, you will visit 3 to 5 wineries, where you will taste several varieties of wine, participate in wine tasting lessons and taste traditional Santorini dishes or cook few of them, using one of the wines. The most interesting wine tours are those who include a visit to Santorini wine museum, which is quite interesting, or a visit to Akrotiri archaeological site, one of the most impressive historical legacies of the island. You should know that Wine Enthusiast magazine chose our island as one of the best wine destinations for 2014. First of all, let’s notify that there is Akrotiri village, the modern settlement and the Akrotiri archaeological site, which is located about 2 km to the south of the village. The archaeological site is located at the southwest part of Santorini, 13 km from Fira, the capital of the island and a visit here is one of the top things to do in Santorini. Akrotiri was inhabited from about 3000 B.C. but the first indications of organized society take us back even to 4000 B.C. Excavations have shown that Akrotiri was one of the most important settlement of the Aegean, till its decline, just before the volcanic eruption. The architecture of the settlement speaks for itself. On the 200 acres area the ancient city had two and three store structures with several rooms on each floor, and probably the first sewer system worldwide. Inside the buildings there were colorful frescoes illustrating the daily activities and occupations of the inhabitants. The findings also suggest the highly developed commercial relations of Akrotiri with almost all the ancient world of the Mediterranean. In the residences were found objects made in Dodecanese, Cyprus, Syria, Egypt and other locations. Most of the objects found in Akrotiri were transferred to Museum of Prehistoric Fira. After the exploration of Akrotiri, you can proceed down the road where you will find a beach and you can refresh yourself and just few hundred meters to the west of the beach there are traditional taverns were you can enjoy your lunch by the sea. You should also know that the Red Beach is right behind the mountain from where the taverns are. Santorini boat trip is a wonderful activity and it should fit to your things to do in Santorini. You can find and book many varieties of boat trips both at cheap prices as well as luxurious semi-private or private tours. There are also many choices you can make regarding on which boat you like to take your boat trip. Small catamarans, large catamarans, boutique wooden boats are the dominating categories. The itineraries of boat trips use as departure points many ports of Santorini. Old port of Fira (Ormos), the main port of Santorini (Athinios), Ammoudi port (Oia) as well as Vlychada marina are the most used. Depending on which departure port suits you, should choose your trip. Usually a boat trip includes a visit to Nea Kameni (the volcano) and a stop for a bath in Hot Springs in Palia Kameni. It is also interesting to choose the boat trip that includes in its itinerary a visit to Thirassia island (the small island that it is considered as a sister of Santorini because they look alike). If you are a romantic type of person, there are also sunset tours. It’s one thing to admire the Santorini sunset from one of the villages and another from a boat. Sunset boat trips usually include stops in couple of the most famous beaches and/or Hot Springs for a bath and than a dinner in the open sea during the sunset. If you are up to it, semi private boat trips are the most relaxing. 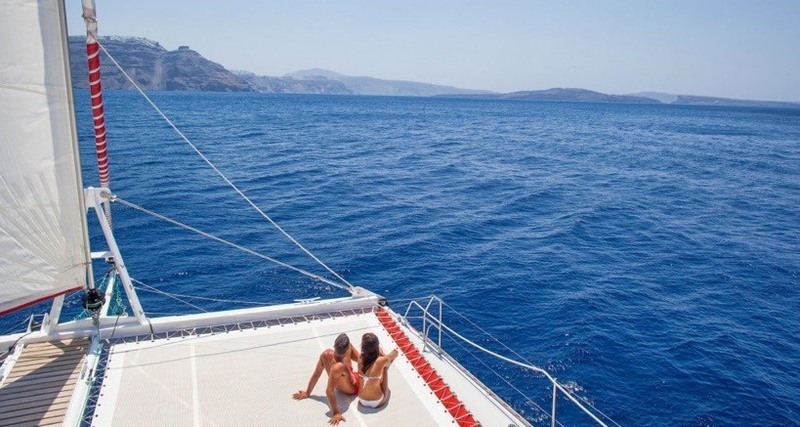 They might be more expensive, about 140 Euros per person, but you will be sailing on luxurious boat, your dinner, which is included in that price, will be cooked and serve with Santorini wine as you swim, during one of the stops and unlimited soft drinks are included. You should also take in mind that there are boats with glass bottom offering an underwater view. These boats usually do not offer private tours. Santorini cuisine is definitely something that you should explore during your stay. We don’t mean only the wine. The volcanic soil, lack of intense rain, which during the summer months is totally absent, gave to Santorini agricultural products unique taste and quality. Santorini fava beans are probably the most well known product of the island. It can be served in many ways. Fava with capers, onion and extra virgin olive oil is a popular appetizer. It’s also popular for fava to accompany pork dishes. White aubergines (eggplants) are quite unique. It’s known that its color and round shape is attributed the volcanic soil. It has a juicy texture and sweet taste. Santorini cherry tomatoes are another local product. You can enjoy it in any dish in which tomatoes for. Cherry tomatoes are frequently served with scrambled eggs or used in omelette for breakfast. Of course more widely you will see these sweet tomatoes in Greek salad or in a form of fried tomato balls. Chloro cheese is the unknown product of Santorini. Chloro it’s made from goat’s milk. Its form is quite creamy but the locals usually put it to brine in order to make it tougher. You will probably not find this cheese in any restaurant or tavern. Its production is very limited but you can search for it in free market shops or in shops that specializes in selling Santorini products. There are many beaches to visit in Santorini. But if you haven’t got the time to see most of them, there is one that you should definitely see. A visit to Red Beach is on the things to do in Santorini list, not because it’s one of the most famous beaches in Mediterranean but because you deserve to see this spectacular sight. This vertical red color iron rich cliff with the sand on the beach has “volcanic place” written all over it. It’s located near Akrotiri archaeological site, 12 km south of Fira which is the capital of Santorini. You can get there by local bus line or by sea taxi. It’s a quite hot place during the summer months. The beach front side faces south and the cliff is on the back side, preventing northern breeze to reach the beach. Therefore don’t forget the sunscreen, lot of water and a hat. You should also know that due to the Red Beach publicity, it can get very crowded, so get there as early as possible. Ancient Fira (or Thira) was built on a top of Mesa Vouno mountain at an altitude of almost 400m, this is the one that separates Perissa and Kamari. This ancient city started to develop about 900 B.C. and it was inhabited till early Byzantine era. The name of this impressive monument was taken from the ruler of Santorini, Theras. Ancient Fira had its main road, about 800m long and in some places 4m wide. These measures are quite impressive, taking in account that it’s built on a top of a mountain. It had its Agora, about 110 m long, a temple at its southeast side where the inhabitants cherished Apollo, Hermes and Heracles, Ptolemy etc and a theater built in 200 B.C. on the mountain slope which had the amazing capacity of 1500 viewers. Αncient Fira is located 11km from the modern capital of Santorini, Fira. To get there you must first reach Kamari village. The sight is open daily, except Mondays, from 08:30 to 14:30. If you don’t have your own vehicle, you can get to Kamari using local bus line. Afterwards you can find a travel agency that uses private buses to transfer visitors up the hill on hourly bases. If you decide to visit Ancient Fira, we suggest you do it early before the hot summer sun starts to show its “teeth”. Don’t forget to put sunscreen and it will be wise to wear a hat. If you visit the sight early, you can combine your trip with a swim in Kamari beach as well as with lunch in one of the local taverns that offer delicious dishes. Under no circumstances do not forget your camera! The view from Ancient Fira is breathtaking. You can see Kamari on the one side and Perissa on the other. During days with good visibility you will be able to see even the island of Anafi. Santorini as an island with volcanic origin has many interesting and impressive underwater spots that you can visit by scuba diving. Diving is in the category things to do in Santorini not only for professionals but also for amateurs lovers of this water sport. Diving centers in Santorini can be found at the most well known beaches of the island as well as on the west side of this geological marvel. There are also diving centers which have their base in villages not close to any beach like in Pyrgos village. Most of diving centers in Santorini will arrange your transfer from a hotel that you’re staying to their facilities or to the departure point, where you will get aboard a boat and be transferred to the diving site. Underwater scenery of Santorini is very rich, with variety of diving chooses. You can explore the impressive Kimberlite pipes, located in two different places, there are four shipwrecks at a different depths. Probably the most spectacular wreck is located near the volcano and it’s called Marina. You will dive between 7 and 14 meters deep and you will be able to get inside the ship. Another impressive legacy is located between Nea Kameni and Palaia Kameni, a World War II steam ship wreck with evidence of an on board explosion. Near Aspronisi, there is an amazing wall that starts at 4m depth and reaches almost 70m. This wall has its unique and rich marine ecosystem. Scorpion fish, lobsters, sponges and many other sea creatures live there. If you like to feel more like history explorer, there is the Adiavatous reef. At this diving spot of Santorini, you will see the old port of Fira that sank during the volcano explosion. Sights like this one witness the power of nature over the human ingenuity. Of course a diving experience in Santorini couldn’t be completed without underwater caves! There are magma caves that you can dive into. One of them is particularly impressive due to its lighting from above. Also interesting underwater sight is the sign placed in front of Coustos cave, in honor of the legendary sea explorer. Donkey Ride is a traditional experience among the things to do in Santorini. Rather controversial among the visitors of Santorini, donkeys were a form of transportation for many generations, not only to inhabitants of our island but most of Cyclades. Some people characterize donkey ride as animal abuse and others as a unforgettable experience. Even till today, there are government laws that allow only donkeys (and bikes) as a form of transporting goods inside many villages of Santorini. This ensures the quiet among the tight alleys as well as preserving tradition. The most well known “itineraries” where you can take a ride on a donkey are from old port of Fira and from Ammoudi port to Oia village. Most of the visitors of Santorini choose to walk down the cliff and use the donkeys for the opposite, uphill route. Donkeys are also used in traditional Santorini weddings, where the bride is transported on their back to the church. A variety of tours on a donkey, that takes you from sight to sight, can be arranged. Choosing a donkey over a horse, you will definitely feel more like a local inhabitant of Santorini, living in not that much distant past, taking into account that the cable car was built in 1979. Till then the only way of transport from the (old) port to Fira village were the donkeys. A helicopter ride over Santorini is definitely something that you will remember. The flight takes from 20 to 30 minutes and includes a flight over the volcano, the island of Thirassia and the impressive Santorini villages built near the cliffs as well as over some of the island beaches. Over which beaches you will fly above, depends on couple of factors and will be decided by the pilot before the flight. In the itinerary, most of the times, are included all beaches at the south coast of Santorini: Red Beach, Perissa, Agios Georgios and depending on the Santorini airport traffic also Kamari.